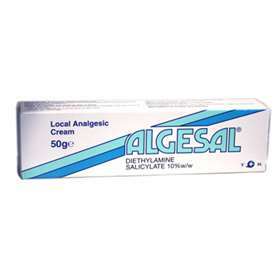 Algesal Cream - Contains Diethylamine Salicylte 10% w/w - Local Analgesic Cream for Rheumatic and Minor Muscle conditions. The active ingredient in Algesal creates a slight irritation to the skin, warming the surface and alleviating the pain. It also has an anti-inflammatory effect to soothe muscles. Do not use on broken skin. Do not use on children under 6 years of age or any child with a history of fits. If allergic to aspirin. Apply a small amount to the affected area and massage until fully absorbed into the skin. Apply three times a day. DIETHYLAMINE SALICYLATE, ETHYLENE GLYCOL, GLYCEROL MONOSTEARATE, STEARIC ACID, THIETHANOLAMINE, PETROLATUM, LIGHT LIQUID, PARFFIN, MICROCRYSTALLINE WAX, LAVANDIN COMPOSITION, PURIFIED WATER.